WHO: Teachers that are looking for a simple way to check for student learning, quickly and easily. 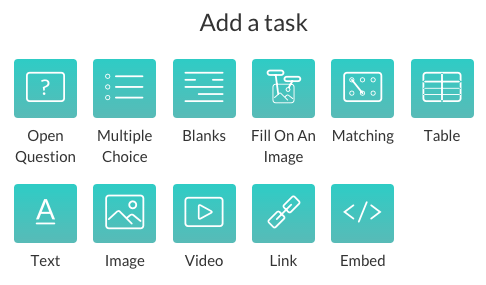 The first four choices are straight forward, but the “Send Image” option allows students to draw their own answers on a basic whiteboard tool. The students select/draw/type their answer and hit submit. These answers are then immediately visible on the teacher’s view. An option is available to display/hide names if the responses are being projected in front of the class. This is accomplished by clicking on the person icon in the top right corner. The web app is in beta, and somewhat limited at this point in regards to collecting data. If this is the option a teacher will be using, they will have to quickly note or screen shot responses, otherwise the data is gone when the next question is asked. When using the app, the teacher is able to share questions and export results using Evernote. Hopefully in the future it will allow the option to send to Drive as well. WHEN: Ping Pong is ideal for checking understanding, exit tickets, classroom polls, and other similar activities. While not as robust as other formative assessment tools, Ping Pong is great in its simplicity. Upon finding out about the program, I was able to be up and running in less than two minutes. Back in October, I posted about Zeal and it’s easy to use interface for digital Exit Tickets. This post includes a tutorial video to get your classroom started using Zeal. WHO: Teachers looking for ways to keep students focused throughout the school day using brain breaks and more. HOW: Sign up for an account at www.gonoodle.com, create a class, and get started! Teachers choose a champion for the class, and the more videos that have been viewed make the champ stronger. WHEN: The videos at GoNoodle are great to start each day, or even each class. There are videos to help student relax before taking tests, and others to help refocus energy when students start getting restless.